I hope you are having a great week and all ready for Christmas~ I want to wish you and your families a very Merry Christmas and a Happy New Year! 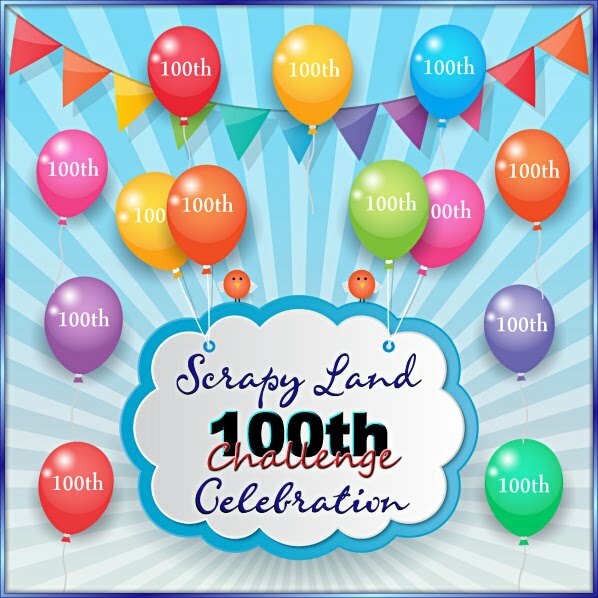 Several members on the Scrapy Land Design Team participated in a Christmas card exchange for this post. 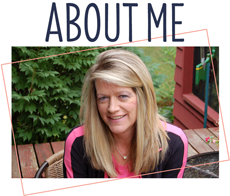 Here is the card I sent to my sweet friend and team member, Anne. I also made a matching tag to go along with the card. The tag is Tutti Designs Stitched Nesting Tags Die. 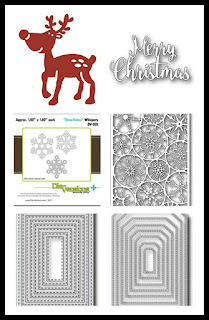 Layered the sweet Rudolph, the Merry Christmas and added a pretty snowflake. I finished with tying on some ribbon and added a gold string bow. 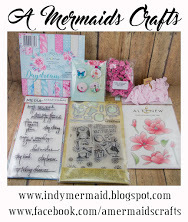 This is amazing card I received from my dear, sweet friend Lisa from A Mermaids Crafts!! It is absolutely gorgeous and even more gorgeous in person!! Also, thank you Lisa for not only the wonderful card/ornament..thank you for all the goodies! I love it all!!! Super cute set. I sure do like that Rudolph die. Happy Holidays! Sooooooooo cute! LOVING that Rudolph!!!!!!! LOOOOOOOOOVE this!!! What an adorable set, just gorgeous! Happy Holidays my dear! Oh my gosh. 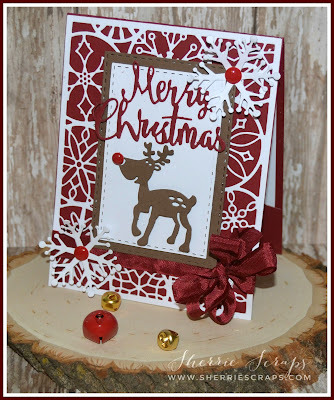 Love that deer and this card! Thanks for sharing at The Merry Christmas Challenge. The card and tag are gorgeous and even more so in person!!! I love it! Rudolph's red nose and all the red accents are a perfect embellishment. Thanks so much Sherrie!! I love this card and tag set. Very pretty in the red and white. 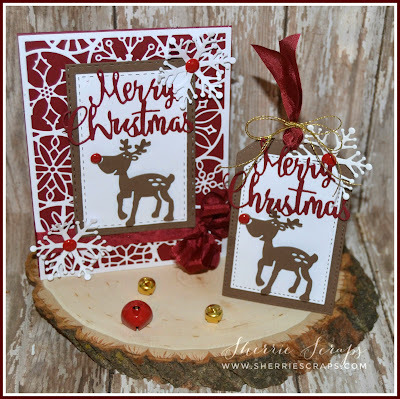 Fabulous card & tag Sherrie!! 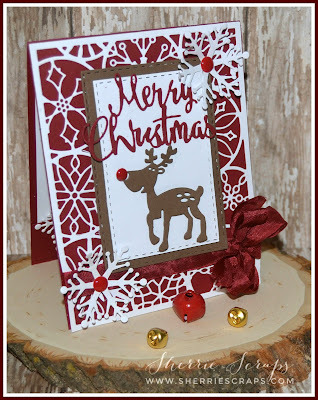 Love the red/white theme and Rudolph is so adorable!! Merry Christmas! 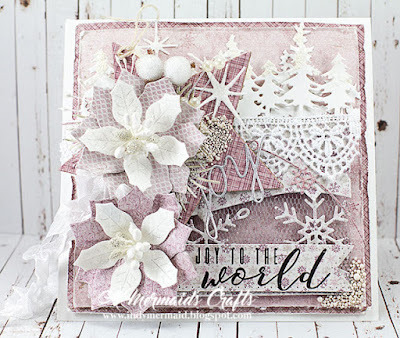 Your card and tag are so gorgeous! I just love gorgeous dies you used and Rudolph is absolutely adorable! 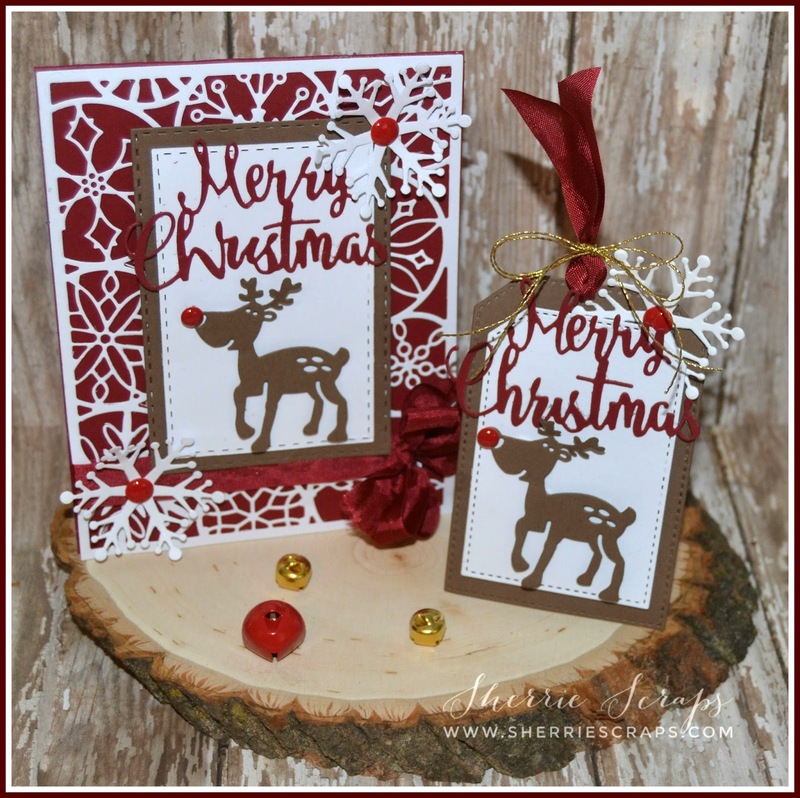 Beautiful card and tag set Sherrie! 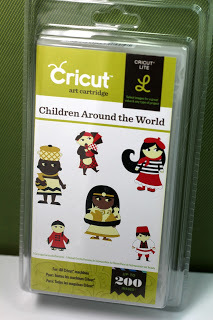 I love all of the wonderful die cuts! I love that adorable Rudolph on your gorgeous card!! The snowflakes really stand out on the red background! Absolutely gorgeous!! I am sure Anne loved this card!! Oh how cute! I participated in a card exchange but we did it back in October! 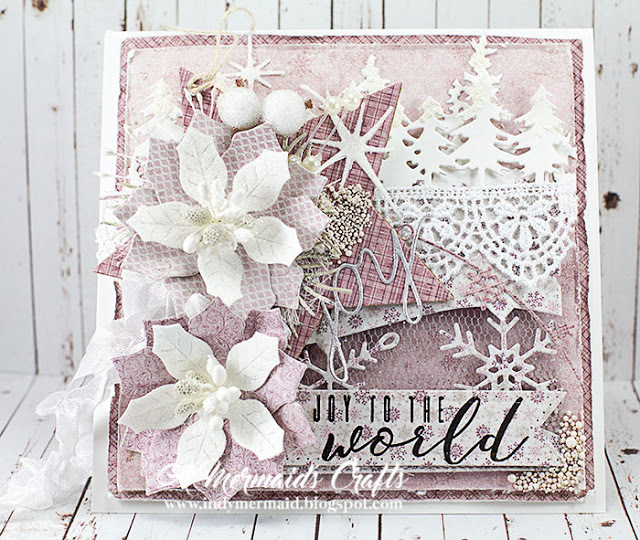 Your card and tag are so sweet! I’m sure your partner loved it! Hope you have a very Merry Christmas!! Such a beautiful set!! 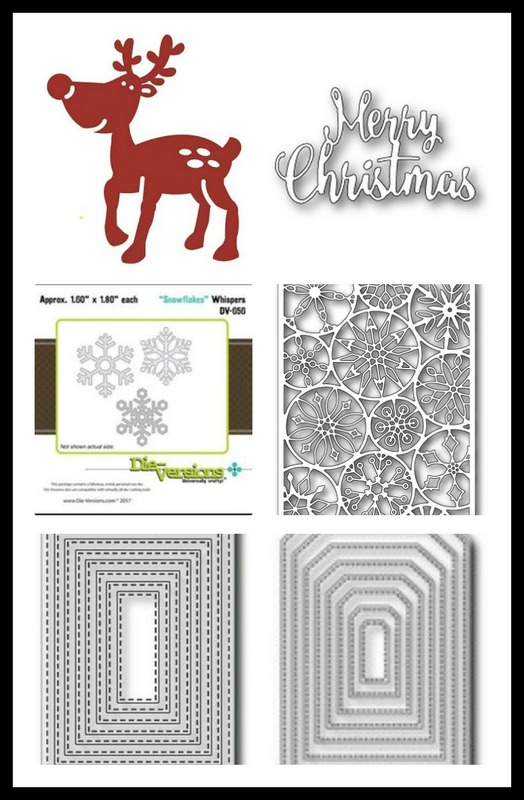 I love the beautiful deer & pretty snowflakes!!! 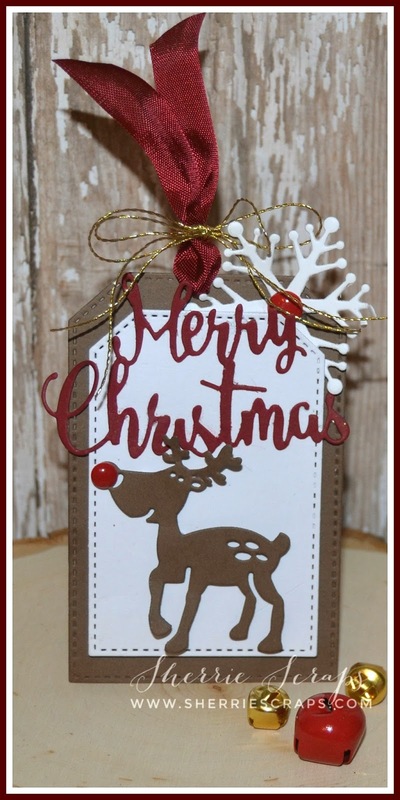 What a Cute Card and tag.Love the ribbon. I'm sure Anne loved It.Merry Christmas and Happy New Year to you friend. My dear, sweet friend, this is the most adorable gift card and tag set ever!! I love the Rudolph!! He's so sweet!! The details are amazing! Stunning card ! Rudolph is adorable !! !